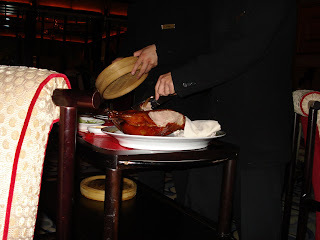 Peking duck, that was the main attraction, and the reason we choose Wing Lei in the Wynn as our last meal in Las Vegas. 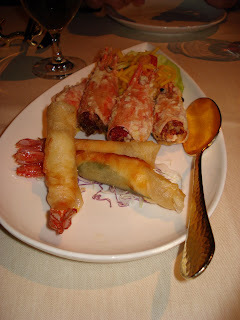 Now, I realize that it seems that I only enjoyed Asian food in Las Vegas, and that’s pretty much true. So if you don’t like my preference for Asian culinary delights, you can go back to your potted meat & spam. 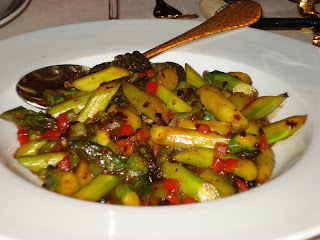 Anyway, Wing Lei is Steve Wynn’s take on formal Chinese, a banquet style, and while there were stand outs, it’s not something I would put up for a repeat visit. Scanning the menu, I was thrown for a loop due to the presence of sizzling rice soup. This is one of my favorite Chinese dishes, even though it’s nothing more than a wonton soup sans wontons. When done correctly, it’s a great dish, complete with a showy entrance. The soup is supposed to be brought to your table in individual portions or a large container and then cooked then baked rice is introduced to the broth and literally sizzles from the hot air pockets meeting the hot broth. This was a disappointment due to the fact that the bowls were brought to the table with no sizzle and no showmanship. It was a decent broth soup with chicken and rice, nothing more. 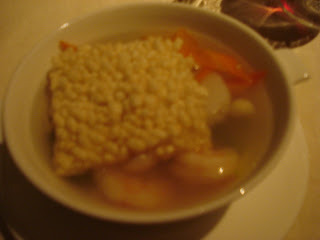 The soup was a major strike against Wei Ling. 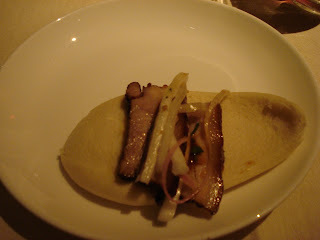 I know it has become a little passé in the restaurant world, but can you honestly turn down a good pork belly dish? This was again not bad, with a nice flavor, but it was completely overshadowed by the odd looking sticky bun dough. The road to culinary hell is paved with good intentions, and while my parents ooh and ahhed at the fried shrimp heads, I had seen it and was unimpressed. This could have been from a corner Chinese take out joint had it not been for the heads. 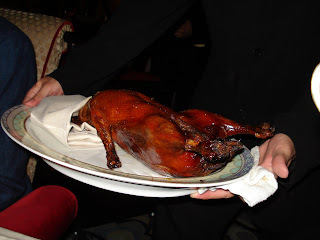 When credit is due, I am more than happy to give it, and Wing Lei did a great job with the Peking duck. I loved that they didn’t just show up with a carved duck. They brought it on a cart, presented it and then went to carving it by our table. 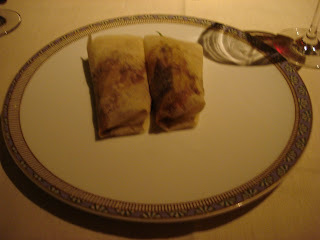 They first made Peking Duck moo shoo wraps, and they top knotch. With a little dab of hoisin sauce, the meal was on the way to being saved. A second dish with the duck took completely by surprise. I knew that the moo shoo had not used all the duck, but when the waiters came back with this platter full of duck lettuce wraps, I was impressed. Lamb is something that only my dad and I enjoy, and this was superb lamb. 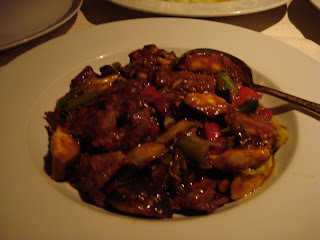 Tender, a little spicy in a rich brown sauce, it perfectly complimented the next dish. Tofu is really something I’ve always enjoyed, it’s only been of late that I’ve actively looked for dishes in restaurants and recipes containing the bean curd. If you have someone who doesn’t like tofu, make them eat this dish. 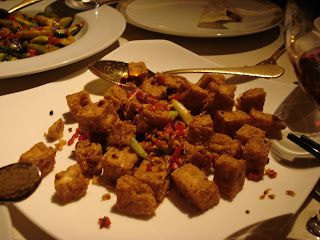 The tofu was delicious crisp yet still silky inside, and it had a delightful amount of garlic and hot peppers. 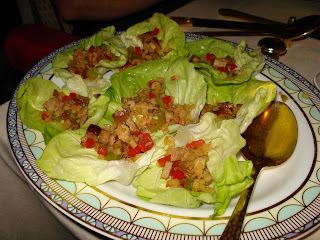 I think I even detected the use of Schezuan peppercorns, only because my tongue was slightly numb. 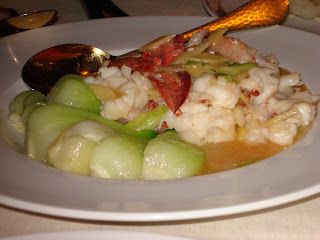 Stir fried asapargus and lobster with baby bok choy, both good in their own way. The competition was just too stiff, I horded the lamb and tofu and left the lobster for the others.